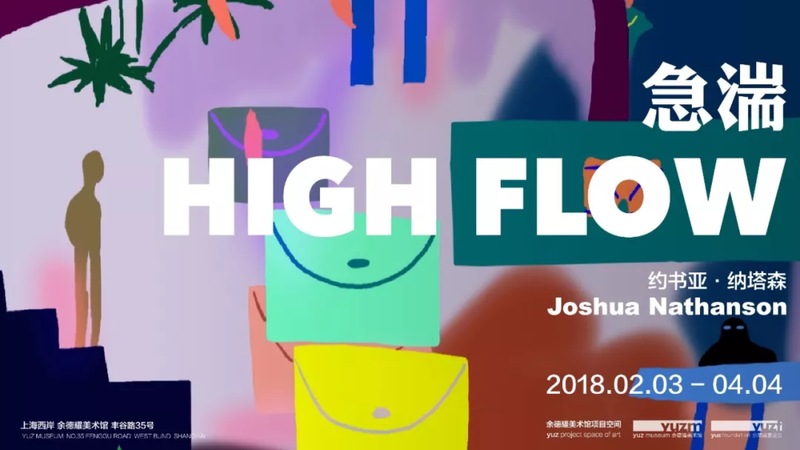 Yuz Museum is pleased to announce Joshua Nathanson’s first solo exhibition in China, “High Flow,” from February 3rd to April 4th, 2018 at Yuz Project Space of Art. Drawn from the artist’s residency in Shanghai last year ( review: Residency Artist Joshua Nathanson in Shanghai) , a new body of works including five large-scaled paintings, a hand-painted mural, a video animation, and a towering 3D-designed sculpture will be exhibited in the gallery, representing a continuation and a twist in the artist’s practice – a “scope creep” of his concerns within painting to new surfaces, dimensions, and geographies. Just like the Impressionists’ plein air paintings of the bourgeoisie, Los Angeles-based artist Joshua Nathanson begins his work by sketching the city’s landscapes such as the shopping malls and public parks on site. 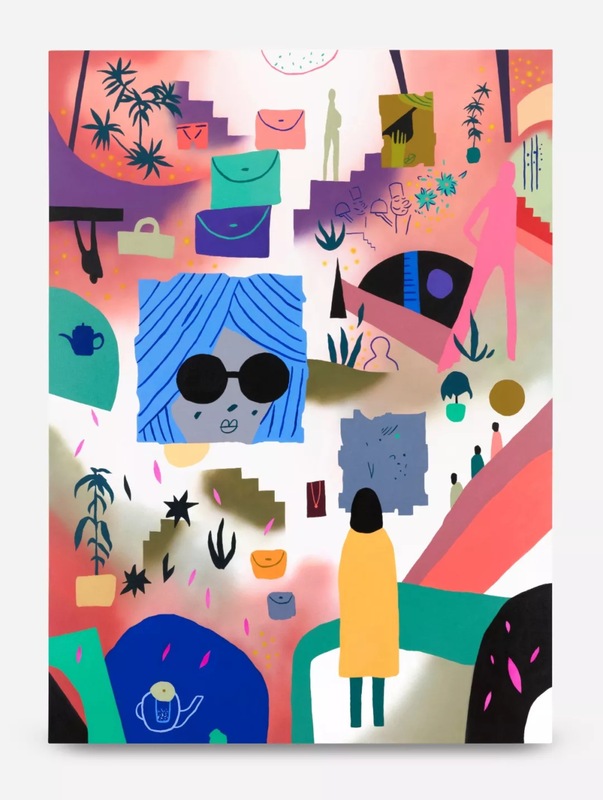 The artist then creates digital studies on his computer in order to experiment with color, turning them into acrylic paintings on canvas through air-brushing and traditional brushwork. Combining traditional painting approaches with the newest technology, Nathanson is quickly recognizable for his vivid color, layered composition, and a distinctively loose, sometimes childlike drawing style. Courtesy of the Artist and Various Small Fires, Los Angeles. Photo by David Del Francia. For this exhibition, the artist continues his interests in two types of utopian spaces,depicting the “international style” of shopping malls inspired by the glossy malls of Huaihai Road and the public parks such as Gucun Park and beyond. The park represents a return to nature, pointing toward the history of humanbeings; while the mall suggests the perfection of consumerism within late capitalism. “But perhaps the real future will takeplace in The Cloud?” suggests the artist. Capturing the fragments of the city, Nathanson’s artworks convey the feeling that all things are floating and suffused with a dreamlike quality. The air circulates freely around the works, carrying waves of déjà vu, like water cascading downfrom the apex of the city. The exhibition will open on February 3rd and will run through April 4th, 2018. Yuz Museum will invite artists Joshua Nathanson and Robin Peckham, editor-in-chief of LEAP to give an opening talk for visitors as well as a guided tour. The artist will also lead a workshop and teach the children to depict the landscapes in Shanghai for the coming Spring Festival. Follow our wechat next week to find more information about the workshop. Joshua Nathanson (b. 1976) received his MFA from Art Center College of Design, Pasadena in 2006, and BFA from School of Visual Arts, New York in 2000. Nathanson now lives and works in Los Angeles. Significant commissions include Museum of Contemporary Art, Chicago and Los Angeles County Museum of Art, Los Angeles. His solo exhibitions include: “Forest Lawn”, Downs & Ross, New York, 2017; “Make Memories with the Bunny”, Kaikai Kiki, Tokyo, 2016; “Froth”, Luce Gallery, Turin, 2016; “Labor Day”, Various Small Fires, Los Angeles, 2015; “Balance”, Diktatorian Project Space, Berlin, 2005 and etc. Group shows include: “Electronic Superhighway”, Whitechapel Gallery, London, 2016; “Takashi Murakami’s Superflat Collection – From Shōhaku and Rosanjin to Anselm Kiefer”, Yokohama Art Museum, Yokohama, 2016; “I Know You Got Soul”, ARNDT, Singapore, 2015; “Prince at the Forum”, Beacon Arts Center, Los Angeles, 2012; “Big Poster”, Pro Choice, Vienna, Austria, 2009 and etc.